I took this photo on Newbury Street in Boston back in June. 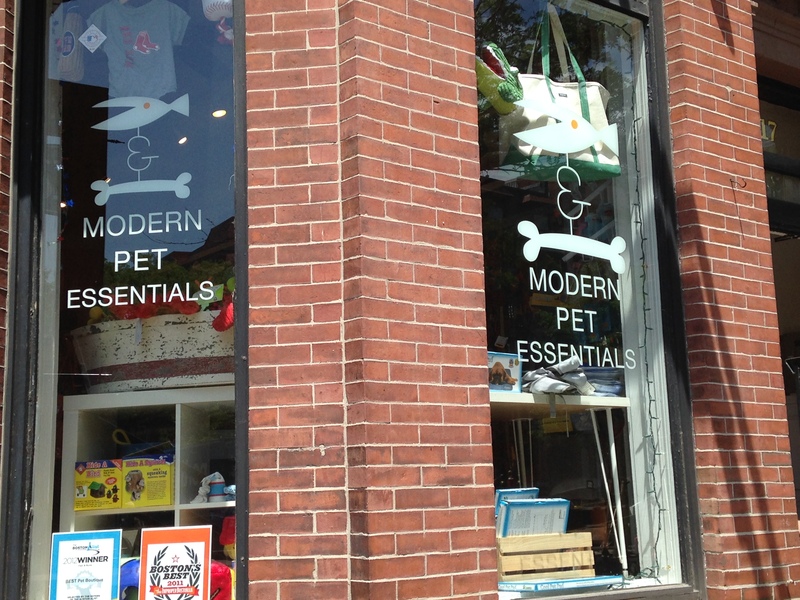 I loved this store window, which made made me wonder what makes a pet “modern” and what constitutes “essentials.” The shop is Fish & Bone. I liked the quirky humor. Unfortunately, I did not take time to browse that particular “pet boutique,” so I can’t take this visual analysis to the next level. I did learn that this shop was ranked 1 of 15 for Boston’s “Best Pet Boutique” on Boston’s A-List. The notion of a “pet boutique,” has, of course, become commonplace. Indeed, it seems every town—not to mention major cities and chi-chi shopping districts—must have one. On many American “Main Streets,” a pet boutique is a must, not unlike an ice cream parlor or a donut shop. Even in DeLand, Florida, far from the tony allure of Newbury Street, we have “Grrs-n-Purrs.” In New Smyrna Beach, on Flagler Avenue, Silly Willy’s Pet Boutique. A pet boutique has become part of the vision of an American “Main Street,” not unlike an ice cream parlor or a donut shop. I’ve bought nice toys for my cats on a number of occasions. They play with them. But they also play with boxes that come in the mail, paper towel rolls, and my i-pod headphones. So, are the toys more for me or for them? hand-crafted cat walkways that blend with a household’s decor? Though I don’t know how many people actually invest in these products, their very existence—and our fascination with them, judging by social media proliferation—is a window into the intersection of our emotions, our pets, and consumerism. What kind of fantasy do we fulfill by looking at this furniture, imagining it in our house (or, for some, by actually purchasing these goods?). The larger fantasies here must have to do with imagined visions of ideal household spaces. Certainly, and importantly, the names, shop windows, and very existence of pet boutiques inscribe a quirky humor into the consumer landscape. But that doesn’t make them any less consumerist. We might grin at the shop window and even (in my case) mock our own decision to purchase the $8 catnip toy. But we’re still buying. We’re still converting wants into needs and needs into wants.